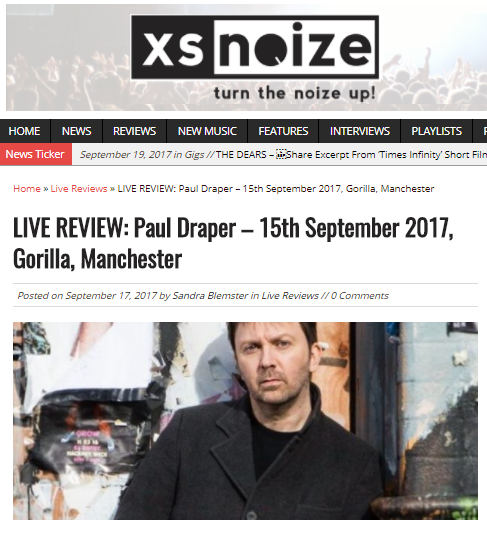 Webzine xsnoize has given a great review to the 2nd gig of former Mansun frontman Paul Draper’s debut tour, at Gorilla in Manchester on the 15th September. “He entwines Spooky Action and Mansun songs including Disgusting. The night is set the air electric. Grey House is industrial meets squelchy reverbs. The audience is happy and then indeed rapturous as for an encore Paul sings the favoured Mansun track Wide Open Space. Every corner of the venue is bouncing with sound. It’s only when we think they’re gone but no, a second encore brings Don’t Poke the Bear from Spooky combining synths sounds and 1950s “spooky” sci-fi effects thus bearing the fruit of more than 10 years hard work in the making. Tickets are now on sale for the follow up fourteen date February / March tour HERE . You can read the full xsnoize review HERE .